The tragedy that took place in Norway on July 22 pulls on my heart. At this time of year, the season of Leo, we are meant to relish our first harvests. It should be a time to enjoy the gifts of the earth and claim the shining glory of our own creations. Yet this season, which should be joyous, is tinged with grief and fear. The very same weekend of the nightmare in Norway, I attended a blissful celebration of love as two dear friends shared their marriage vows amidst loving family and community. They happen to be lesbians, and in our state, Minnesota, they sadly do not yet have the right to make their marriage legal. However, in New York, during this same weekend an abundance of gay couples were legally wedded for the first time. The photos from that weekend, in both states, have been inspiring. Our world is full of sharp contrasts – lights and shadows. For some, love is a courageous act that affirms life. For others hate and fear fuel violence. There is nothing wrong with contrast itself. Shadow and light color our world in amazing shades of complexity and richness. In celebrating diversity, I celebrate others being different from me. However, currently, contrasts between people are creating alarming, dehumanizing divisions where groups of people seem to be living on different planets, and I am afraid that this gives permission for violence. I am perplexed by this division in worlds. How can anyone be threatened by gay people marrying? How can anyone, even the most insane amongst us, think that killing young people will protect from multiculturalism? I acknowledge my fear that such violence might destroy what is beautiful. I pay attention to fear, and I wonder what intention to follow this month, supported by the season and the stars, which will contribute to a lessening of fear and an embrace of life’s joy. I am a person of faith. My faith is the belief that when I commit to such an intention, it changes me and it changes the world. Through this, I add my spark to the fire of enlightenment I want to see manifested. Faith and fire are appropriate Leo themes. Leo is a Fixed Fire sign. The fixed signs hold and protect the archetypal form of their elements. What are the gifts and challenges of fire? How do we work with fire to support our intentions? If fire is the teacher this month, what are the lessons? Fire is a hungry element. It needs to be fed. A proper fire must be built carefully in order to sustain the flame, not burning too quickly and not sputtering out due to lack of fuel. A proper fire, like Goldilocks’ bowl of porridge, is just right. If I intend to kindle a fire that is just right for me to sustain my faith, lessen my fears, and embrace life’s joy, what must I pay attention to? 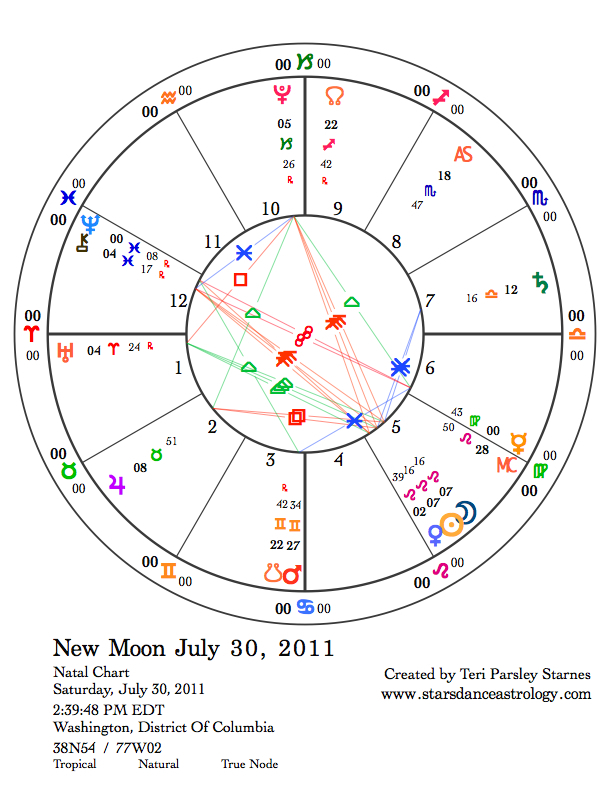 The New Moon chart shows us what we have to work with this month in holding to our intentions. The Sun and Moon are joined with Venus, adding the blessing of love and beauty to our fires. The Moon is soul, the Sun is consciousness, and Venus is love. These are the foundation of intention this month. This trio is part of a configuration called a Yod, or Hand of God in Hebrew. The yod formation points to paradox and holding contrasts until we reach new understanding. The paradox of this yod may be that we are both insignificant and pivotal to creating the world we envision. The paradox is that it isn’t about us and it is all about each of us. What can we do in the face of large, impersonal forces, represented by the other two planets forming the base of the yod (Pluto and Neptune)? We know we are in a paradigm shift right now. Large tectonic plates are moving under us. Where will we end up and will the shift bring more chaos as it unfolds? Neptune and Pluto represent some of the forces of change we are experiencing right now. Uranus, another outer planet is also contributing. "Never depend upon institutions or government to solve any problem. All social movements are founded by, guided by, motivated and seen through by the passion of individuals. " Childlike innocence is echoed in another way at this new moon. Nine of the 11 “planets” in this chart (Sun, Moon, Pluto and Chiron are not planets but for simplicity’s sake termed planets here.) are in the beginning third of their signs. There is a lot of new energy present here, perhaps naïve, perhaps inexperienced, but also perhaps just the thing we need to enliven our fires of possibility. Can we embrace the unexpected and new this month? Mercury retrograde brings surprise. On August 2, Mercury will station retrograde at 1 degree Virgo to move back through Leo. For most of August, Mercury encourages us to rethink our assumptions, especially about our fires. These fires can represent our passions, beliefs, our anger, and our energy. 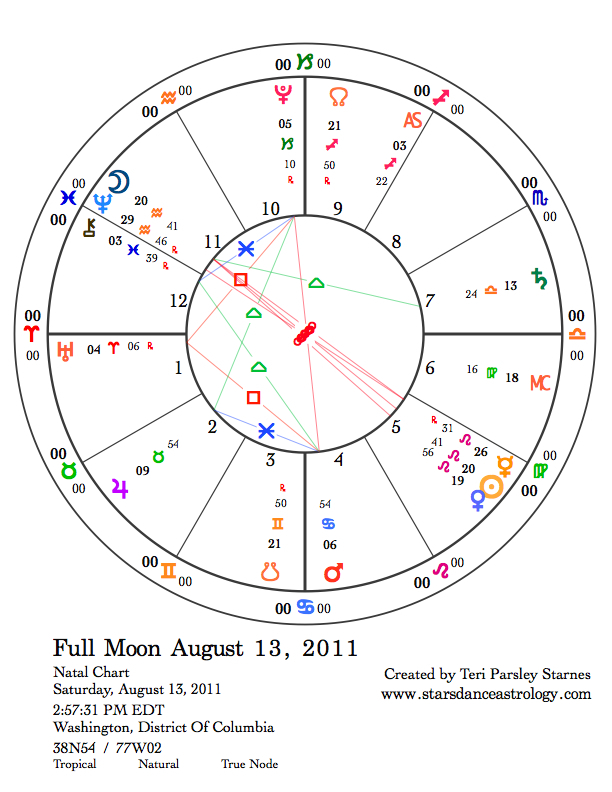 August 16th, Mercury retrograde exactly joins with the Sun and Venus. This represents a time of peak illumination for what Mercury is teaching us about the significance of self and love. I can’t promise this illumination will happen gracefully. Mercury retrogrades often teach us in unexpected ways. This month Mars, usually an ally of fire, will be traveling through the water sign, Cancer. 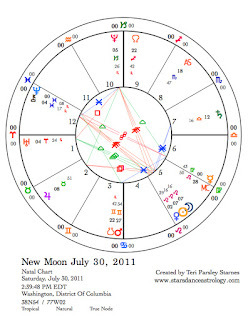 August 9 and 10 Mars will activate the square between Uranus and Pluto. This most likely will bring tension. The desire to protect and defend will we strong. Are emotions at this time in alignment with your intentions? What do you deeply need? Pay attention to the causes of defensiveness. 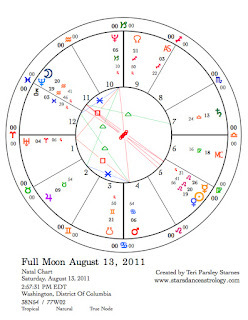 The Full Moon shows the t-square between Mars, Pluto, and Uranus as still very powerful. I wonder about the budget negotiations in Washington, DC. Will anger or frustration manifest at this time due to the polarities in our culture represented by this stalemate? The square between Pluto and Uranus will be present for the next four years. This is a long time to be feeling this restlessness and undercurrent of violence. Not all changes that will happen during this time will be unwelcomed or difficult. But some will. Is it possible that the mindfulness practice we do this month will support an intention to reflect back the values of peace, love, and tolerance? Every single one of us is a world creator. We have to enjoy the diversity and make it work for us. Towards the end of this lunar month, as the Sun moves into the service-oriented sign of Virgo, we may be inspired to be useful in service to the world we wish to manifest. But first, pay attention to Leo’s Divine Fire. What intention will you hold for this month in order to push your glow a little further out into the gloom of fear and hatred? The Sun is a symbol of divinity. Whatever you need to do to feed your own divinity, do it. Be inspired. Be inspiring. Every little light makes a difference.